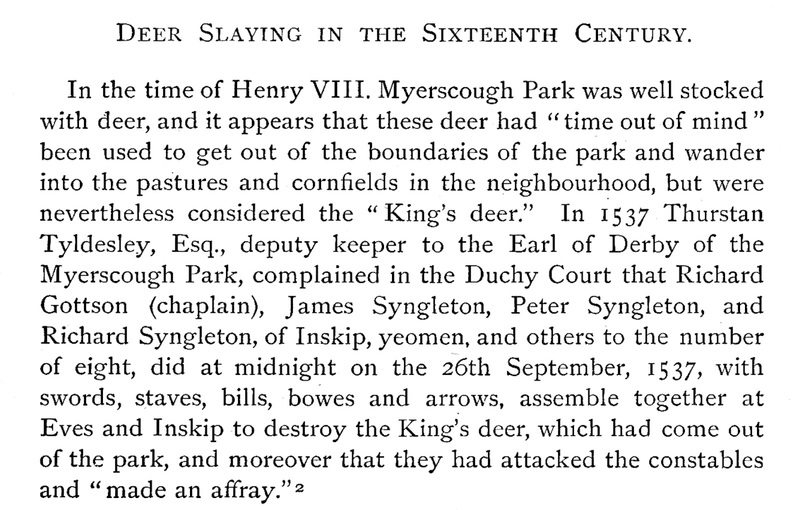 Deer Slaying in the Sixteenth Century. In the time of Henry VIII. 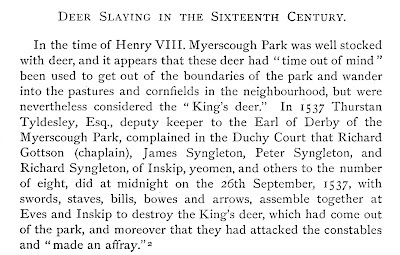 Myerscough Park was well stocked with deer, and it appears that these deer had " time out of mind " been used to get out of the boundaries of the park and wander into the pastures and cornfields in the neighbourhood, but were nevertheless considered the "King's deer." In 1537 Thurstan Tyldesley, Esq., deputy keeper to the Earl of Derby of the Myerscough Park, complained in the Duchy Court that Richard Gottson (chaplain), James Syngleton, Peter Syngleton, and Richard Syngleton, of Inskip, yeomen, and others to the number of eight, did at midnight on the 26th September, 1537, with swords, staves, bills, bowes and arrows, assemble together at Eves and Inskip to destroy the King's deer, which had come out of the park, and moreover that they had attacked the constables and "made an affray."